In 1849, a group of pioneers from Owen County, Indiana decided that their families would have a better future if they headed West. Their destination was Marshall County, Iowa. Being a people of faith, they met together with others of like mind for Bible study and shortly decided it was time to call a pastor for their small gathering. 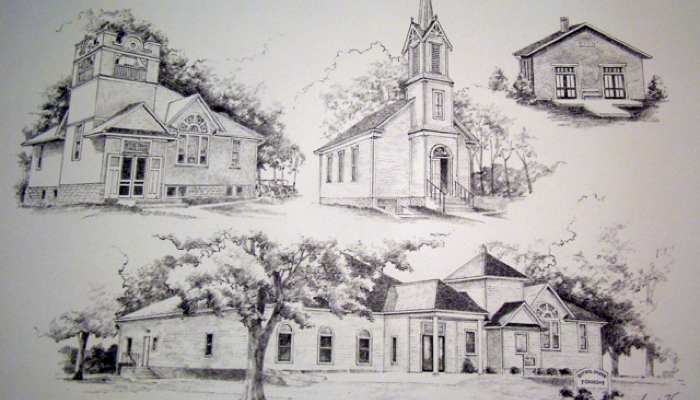 In 1851, they called their first pastor and organized what was the first official congregation in Marshall County. Eventually this group outgrew their home meeting places and built a small brick meeting house in 1863. This building was shared with another congregation in the Liscomb area until it was decided that a church building of their own was needed. What was known as the steeple church was built in a grove of trees west of the site of the brick church. The current structure sits on that same site, the sanctuary being built in 1917. The congregation has a history of fine singing and musical talents, which continues today. Current members include several descendants from the original pioneer families - now into the 5th, 6th and 7th generation of church members here. Yet, the doors are always open to new members, who are readily "adopted" into the Bethel Grove church family. As that church family has grown in recent years, the need for an expanded facility was recognized. Ground was broken in the Fall of 1998 for a handicap-accessible addition which includes a fellowship hall, kitchen, classrooms, offices and a ramp to the sanctuary. That facility was first used on Easter 1999. Each year on Memorial Day weekend, the congregation walks from the church to the cemetery 1/4 mile east for a service commemorating the life of all who have gone before us. Special recognition is given to the founding pioneers of the congregation as well as to veterans of 7 wars. The second Sunday in December is a day-long preparation for Christmas. This "Super Sunday" includes an afternoon of caroling to shut-ins, with as many as 60 members joining in the singing.